I will admit it, I’m hooked on the Friday Phrases Twitter game. Every week I eagerly wait for this micro-fiction party. The concept is, you write a story in a simple tweet and end it with the hashtag #FP. You can come up with your own ideas, or they’ll even offer you a prompt to use. I can spend hours just perusing the hashtag, watching the incredible entries pour in. “How hard is this to do” you might ask? Think about it. A story in one or two lines, complete with emotion and depth? It isn’t easy and it’s amazing to see the stories people have come up with. It’s also a thrill to see how many people favorite, retweet, or comment on the ones you do. This way you have a gauge on how well the “story” was received. Some tweeps have blown me away with their creativity and they were gracious enough to let me list theirs here. I’ve included their twitter handles, so feel free to follow them to see more of their work in the future. Tell me these entries above weren’t great?! 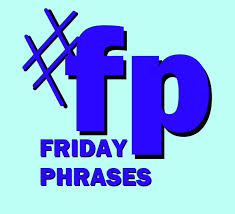 Want to learn more about Friday Phrases @fridayphrases? Click here: http://fridayphrases.com/ and JOIN THE FUN! Did you know you can find out analytics on who is following you on Twitter? You can see gender, interests, where they are from… It’s really interesting to learn. I have some author friends who’ve been blown away by the types of people following them. For me, it’s sort of what I expected. I am reaching a dual gender audience, who likes books, predominantly from the US, though there is a nice 14% following from the UK. They are interested mostly in books, mystery and crime and my top locations are NY, LA, UK and PA. I guess the idea is that if I wish to do a small twitter campaign, I could segment this audience to reach only those people that fit into the top criteria of my most segmented demographic. The question is… will that help me sell books? I’m not sure, but I do intend to find out. So, want to see your Twitter Analytics? Go to Twitter and then go to your “home page.” Find that little wheel looking “thingie.” On the new layout it should be on the very top right hand side and to the right of the “search” box. Then scroll down to Twitter ads, from there you look at the top of the page – the black bar and you’ll see Analytics. Click on that, and then click on followers. It will tell you all your follower stats. I’ve also started playing around – it’s interesting to click on the analytics option, too, and see how effective your tweets have been – scroll through all of this – there’s a wealth of information they are providing right at your fingertips. I can gauge who is interacting with the tweet and which tweet actually generated a clickthru! I plan on watching this a lot and trying to see if there is a way I can use my followers more effectively with this information. I have even started adding photos to my tweets and this stat will also show you if people click on the photo. All of this is information you can use to help your tweets be their most effective. If any of you have done a twitter ad against analytics, I’d LOVE to hear how it went or how you’ve used this information effectively for promotions. 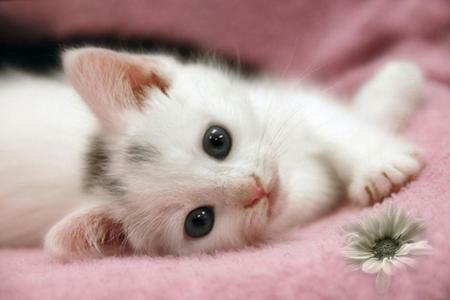 And hoped you liked the gratuitous kitty picture – apparently this is something that helps stats – LOL – I’ll let you know. NOTE: as of 5/19!!! I just found out that not everyone has this feature yet and it’s a ROLL-OUT! You see, I’m just learning these things too – so if it’s not working and you can’t find some of the things I’m listing, I apologize and… they coming! Does Your Book Have a Hook? Find it! You’ve written this great book, told all your friends, family, promoted on FB, Twitter, Google+. Maybe you’ve done a little ad here and there, a goodreads event. Is it selling? Could you sell more? Here is where the hook comes in. Think about your novel and think about where else you could sell this book and who would be interested. I wrote a buddhist based thriller called THE HUNT FOR XANADU. I’ve actually gone onto different buddhist sites and promoted the book there, did a signing at a tea shop and contacted buddhist bookstores to see if they’d like to carry it. The book is really just a thriller but the over-riding element is a buddhism theme. I’ve also done a YA novel with a young deaf boy called FLYING TO THE LIGHT. This has been a much easier book to find a hook for. I’ve contacted every single deaf school in the country – with an email to their librarian and principal, discussing the novel. 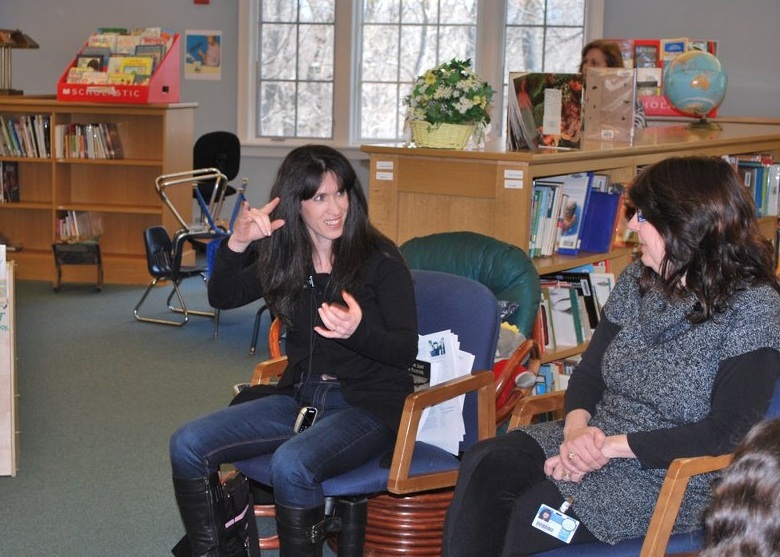 I’ve locally done two “talks” at deaf schools and while I know some ASL, they had an interpreter for me. I’ve gone onto a lot of different deaf sites on FB and promoted the book, and the book trailers there. I’ve also gone online to various deaf websites to see if they would like to give the novel a write-up as well. Nothing is a bad idea. What’s the worst thing that can happen? They say no? We’re authors, I think we’ve heard the word “no” enough times to be able to handle it. My newest angle is specialized book fairs. 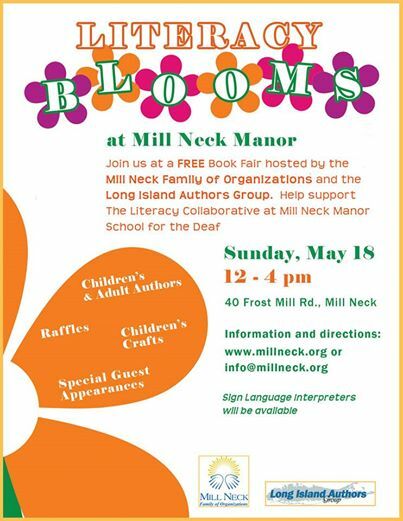 On May 18th, I’ve been selected to join a Book Fair at Mill Neck Manor’s School for the Deaf in Millneck, New York. The program is from 12-4, is free to everyone and is to help support their Literacy Program. If you live on Long Island and want to come, please check out the information included. There will be raffles and activities for children. The trick is to find the hook in your novel and run with it. Maybe your character loves cookies – try to do a signing in a bakery, maybe they are a fantastic runner – contact the local running groups and make some friends there, maybe they like to fish, are a veteran, etc… you get the idea. Find out some distinguishing factors about your characters and how you can find that little “in” to promote it someplace else versus the standard fare. Any cool ideas you’ve done? Can’t wait to hear them! I’ll be honest here – I’ve never been one to read long books about the craft of writing. Maybe it’s my attention span, maybe it’s my fantastical imagination, but I can never get into them. For me, the best way to learn the craft is in pieces at a time. That’s where author Bob Nailor comes in. He has been writing a special blog, featuring author writing tips, every week for over a year. He tackles one subject at a time, in small, manageable segments that are filled with examples and easy, understandable solutions to the problem he is discussing. It’s been an absolute perfect fit for me. So, when I heard he was putting all of them together (a year’s worth of tips) into an “author tip book,” I was very excited. 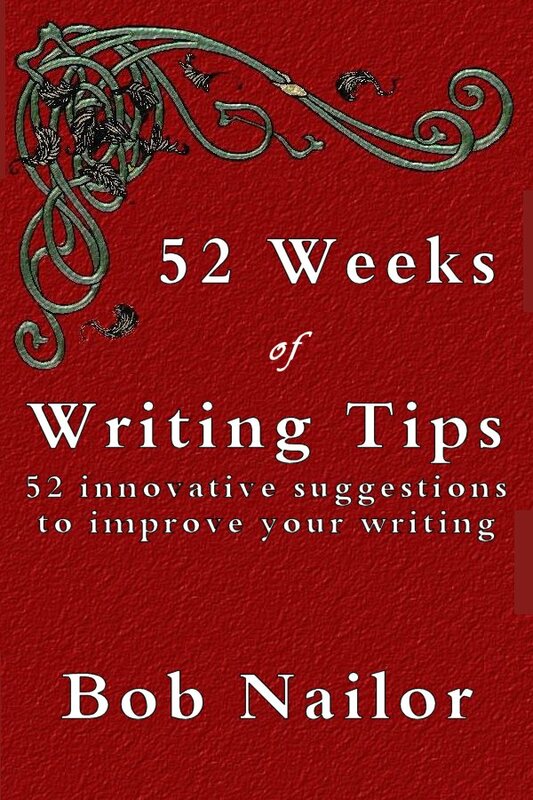 In this new book “52 Weeks of Writing Tips,” there are quick chapters dedicated to a host of topics ranging from character development and plotting, to building a press kit to dialog. SO BOB: Why did you decide to take your writing tips and make them into a book? BOB: To be quite honest, I was minding my own business, doing my weekly writing tip when a very dear friend suggested I put them together into a book. My first thought was ‘Why?’ then quickly realized that I would love to have some of these tips at my fingertips as a quick reference. I attempted to decide which was the most viable tips but couldn’t decide which was more important. It was then I decided to just do 52 tips – like a year’s collection – and offer it to the public for a very nominal price with the lowest price available at Amazon being $0.99. I want to share what I’ve learned, to give back to the community. Why charge? We all know that if it is free, some won’t consider it worth anything. Why so cheap – uh, inexpensive? So everyone can afford a copy. I really do believe in these tips and feel they are a great tool for any writer – both novice and the well-published. SO BOB: Do you follow your own advice? BOB: I’ve always been a firm believer in “Do what I say, not what I do.” Especially with my children when they were growing up. BUT, I really do attempt to follow my own advice regarding these writing tips. I truly feel these tips have improved my writing skills and writing quality over the years. SO BOB: Where do you find your insight to write these tips? BOB: Some are just that – insights. Most of them are tidbits picked up via different writing conferences, writing groups, friends, and even agents. Of course, some tips I’ve been lucky enough to glean out of rejects from editors, agents and publishers. My editor has brought several writing errors to my attention. She attempts to point out the repetitive errors and correct them early so I don’t become so entrenched in doing it incorrectly. My current agent has also shown me tricks to make my writing and stories better. SO BOB: Which tip spoke to you most personally? BOB: You want me to pick just one!? How about two? I’m a notoriously passive writer. “By Zombies” was probably the best lesson I ever learned. It helped me to quickly define whether or not the sentence was Active or Passive and allowed me to correct it, when wrong. When I mentioned it to my local writing group, at first, they just laughed, but as I showed them how it worked, even the non-fiction newspaper reporter saw how it could improve her articles. Of course, “That As●Ing●Ly – Editing Tricks” is another favorite that I use constantly when I finish a work. I immediately review my raw product to see where I can fix those four issues. In doing so, I decrease bad writing, increase word count AND make my writing better and tighter. Is it too late to add more favorite tips? I really like them all! Thanks so much for letting me promote this Bob – I really believe in so many of these and I’ve found them incredibly helpful. Again, here is the link… just 99 cents!